Thousands of passengers were left stranded as the Ninoy Aquino International Airport (NAIA) canceled several international flights due to an obstruction on the runway caused by the Xiamen air accident. All 157 passengers and eight crew were safe with no injuries reported, according to the carrier and the Manila International Airport Authority, while the Civil Aviation Authority of the Philippines had started a probe into the incident. After rounding over the airport for almost an hour, the plane attempted landing at 15:55 UTC, when the accident was reported. Chen Lei, who was on the plane with friends, said the plane touched down but pulled up steeply in a 90-degree angle a few seconds after it aborted the first landing. Due to the incident, NAIA's global runway will be closed until 12pm (11am Thailand time) on Friday, a separate statement from airport authorities said. A Chinese passenger, Wang Xun Qun, who was traveling with her daughter, said in halting English that they embraced each other and were "very scared" before the aircraft landed in a rainstorm. MIAA General Manager Ed Monreal and Civil Aviation Authority of the Philippines (CAAP) Director General Jim Sydiongco are personally overseeing the recovery and clearing operations of the runway. The airport's emergency personnel have set up tents around the accident area, the source said. The aircraft is still resting on its belly near the end of the airport's main runway where it came to a stop after the accident. 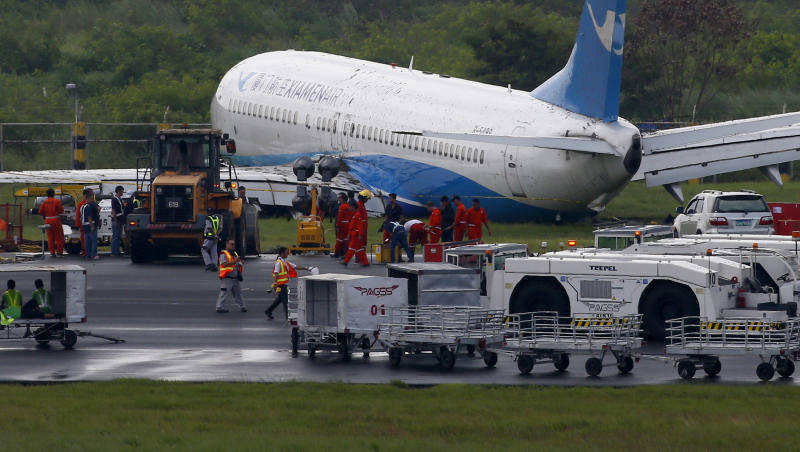 Flight MF8667 from Xiamen to Manila skidded off the runway while attempting to land in bad weather. Photo taken on August 17, 2018 shows passengers waiting at the Manila worldwide airport after the plane crash-landed, in Manila, the Philippines. Airline officials initially said the airport could be opened by noon but later extended it to four more hours. Dozens of flights have been cancelled.